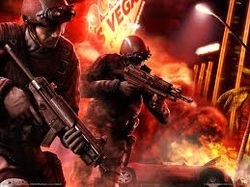 rainbow six vegas - ps3 games for gamers!!!! Las Vegas is burning while the world looks to. International terrorist Irena Morales has amassed an army of mercenaries to besiege America's playground, but her true agenda remains a mystery. Hero Logan Keller and his team have one night to the order to return to the heart of chaos before Irena achieves its ultimate goal. What they discover will not only change Rainbow itself, but also the balance of power firmly in favor of the terrorists. Hails from a military family; served with the Korean Army's Special Forces Unit. From the 707th counterterrorism unit, Jung joined Rainbow. Quiet, efficient, and good friends with Michael Walter.